Is it too windy to fish Chesil Beach? I have had several emails asking me this over the past couple of days. The answer is very simple, no! I love the weather conditions we have at the moment, but only because it makes for some great fishing. The onshore wind is pushing bait fish close to the shore and the 2m plus waves are pounding on to the surf, releasing lots of food into the water. Bass love it, as do Rays and Smoothound. Mackerel are happy to chase the bait fish in really close. The downside is, that once the water colours up, the Mackerel have problems seeing your feathers, so make sure you use very bright ones like silver or red. I did a quick search online to see if I could get a mixed pack of different Mackerel lures for a reasonable price. I was a bit astounded when some of the best deals came up on Amazon. Not really what I was expecting from an online store that started off selling books. If you want see an example of some of the bargains they offer then click on the picture link below. I didn’t get out fishing yesterday, but I did take advantage of the conditions on Monday and went Bass fishing on Chesil. Conditions were almost perfect as you can see in the photo. It just screamed Bass. Unfortunately no one seemed to have informed the Bass. Despite fishing the beach for 4 hours, I didn’t even get a bite. I am hoping that today will be better as I try again, this time I will head further west in an attempt to pick up a Ray and a few Smoothound. Portland: 2m waves on the West side, but the East side is a lot calmer. The water has a milky tinge to it. 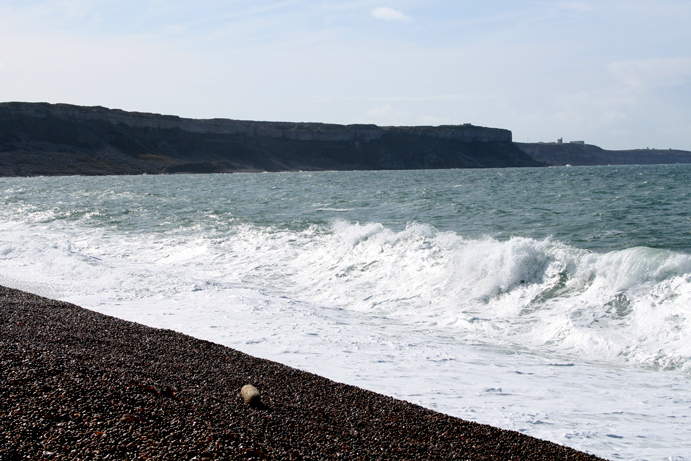 Chesil Beach forecast: Now that the beach has been stirred up for a few days, the fishing should be good. It wont put of species such as Bream or Gurnard, but the colour in the water may effect Plaice fishing. It should be good for Bass close in. I will be heading towards Cogden in search of Smoothound and Rays today. I have ordered some nice fresh Peeler Crab. Those combined with frozen Sandeel should give me a good chance of my target species. Portland: Despite rougher conditions for the past few days, the water clarity around Portland has remained clear enough for lure fishing. I would avoid the West side of the island due to the swell, which could easily pluck an unwary angler off the ledges and into the water. However the East side is a lot calmer. Wrasse and Pollock are going to be your main target from the rocks. If you fancy a bit of a variety then try Church Ope Cove with bait. You can pick up Wrasse, Pollock, Bass, Rays, Smoothound and Plaice from the beach there. Pick out a clear patch to avoid tackle losses. Portland Harbour: Ferrybridge has produced a couple of small Bass and plenty of Garfish on float fished Mackerel strip. I talked to a couple of guys that were snorkelling in the harbour yesterday. They had seen plenty of Flounder all along the sandy areas, as well as large shoals of Mullet. Weymouth Bay: Lots of variety from both piers and Preston Beach. A simple ledgered Ragworm straight down the pier wall can produce surprising results. Expect Pollock, Pout, Bream, Scorpion fish and Wrasse. If you float fish a strip of Mackerel then you should catch Mackerel, Garfish and Pollock. Head into the harbour if you want to try floating bread for the Mullet. Preston Beach will produce flatfish and the odd Bass. It is a good mark when it is windy like today. 3 Responses to "Catch report & fishing forecast for Dorset including Chesil Beach, Portland & Weymouth"
Fished last nite on 1st aug amazing night and very shocked at what ive caught, chose abbotsbury very busy, so me and a mate trecked a long way to fish, nackard and tired we done a bit of maccie was too many around so baitfished with a maccie chunk (not the head) close in n a rag at distance… As light fell the maccie rig was bounsing about mate n i thought it was a doggie or a smoothie but its just like a tope got pics n then my other rod went off connected into it n omg, this is big, took a while to bring in no clue to what it could be.. A lump of a conger as it come up there was a pouting hanging out of its mouth epic time down there proves the long walk paid off away from others try it n a prized fish will come twice.. Will send pics in soon.. It could well be a Tope, there has been reports of a few this year. Send me a picture and I will be able to tell. The best way to determine if it is a Tope is they have translucent noses and shark like teeth.